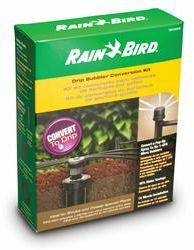 Conserve water and save money by watering your plants directly with drip irrigation. This kit contains everything you need to convert a pop-up spray head into a water-saving drip system that waters flower beds, shrubs and more with pinpoint efficiency. Stop wasteful overspray and enjoy healthier plants while using less water.